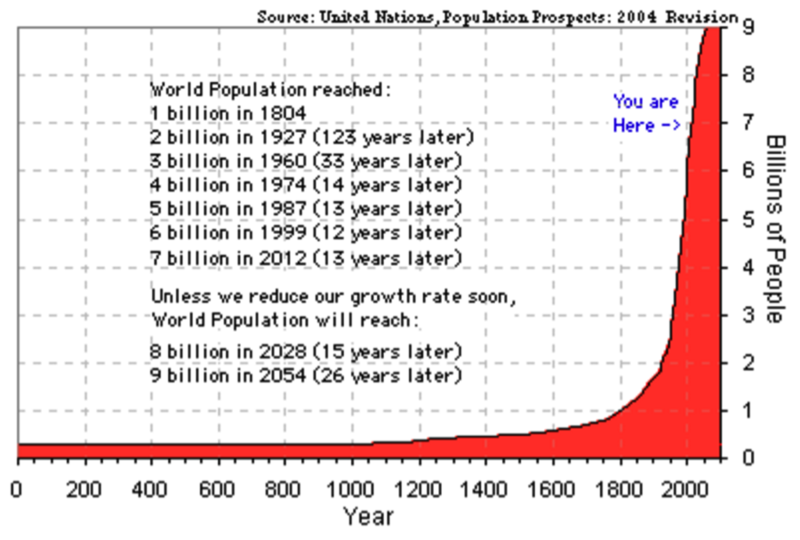 How much of the Earth should be protected from the plunder and hapless trampling of humanity? This is the central question animating E.O. 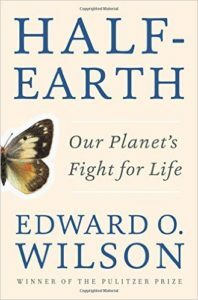 Wilson’s new book Half-Earth: Our Planet’s Fight for Life. As the father of the term “biodiversity” and an early thought leader in the world sustainability, Wilson has long provided society a vast reservoir of concepts and insights that any person thinking about, or working on, sustainability should master. This is why we must all take his most recent thesis seriously. Wilson’s biodiversity lens leads him to focus our attention on the major species collapse that has been underway, and accelerating, over the past couple/few centuries, as humanity has experienced exponential growth, explosive industrialization, and processes of urbanization and suburbanization, all of which have impinged, geographically, on critical ecosystems and the species they support. 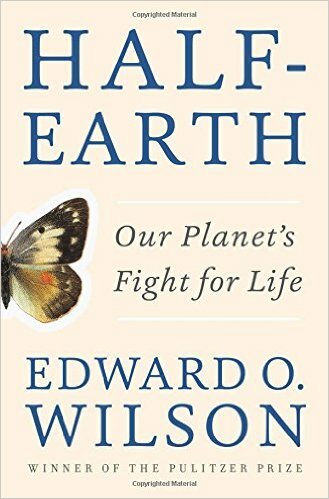 In Half-Earth, Wilson shines a bright light on the need to protect entire ecosystems, as geographically contiguous spaces, since the complex relationships between all of the species within an ecosystem cannot be thought of as severable. 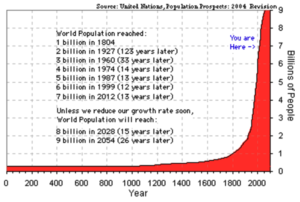 In his estimation, if we are to prevent the impending complete planetary species collapse, which would have cataclysmic implications for carrying capacity of the Earth as humanity’s ecosystem, at least half of the Earth’s surface needs to be protected from the human footprint. 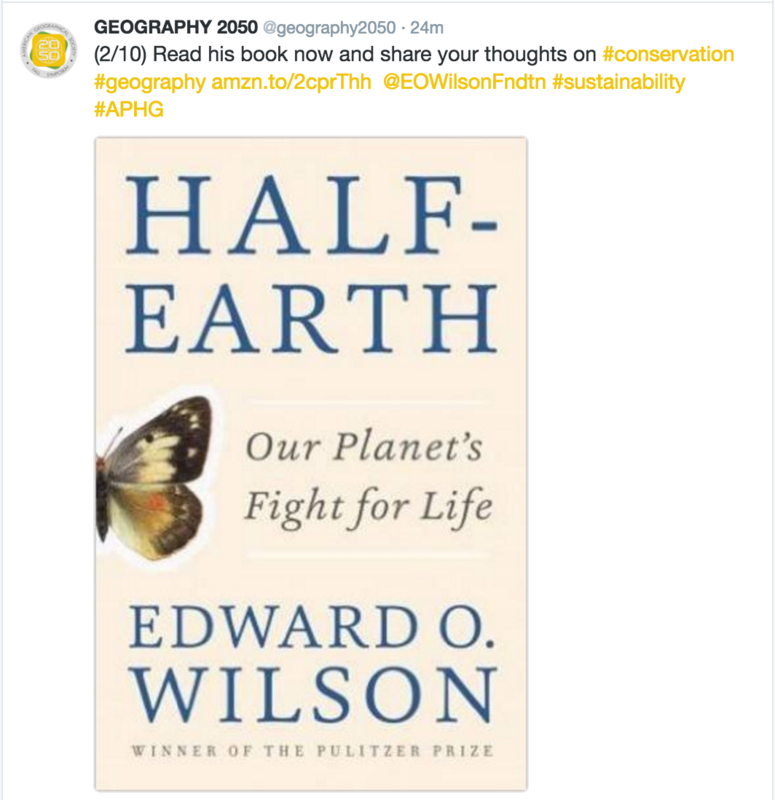 Through the course of his book, Wilson talks about some specific places that he believes should be protected from humanity, but mostly refers to existing protected areas, which of course each have concrete geographical representations, which can be viewed and analyzed in a Geographic Information System (GIS). However, beyond these protected areas, Wilson largely does not tell us what other geographies must be protected in order to get us to half of the Earth’s 509.97 million km2 (let’s just round down to 250 million km2). Well, there you have it. When you place the bounding geometries of all existing protected areas on a map, you are left far from the goal needed for wholesale species collapse over the coming century – at least in Wilson’s assessment. So, what other geographies comprise the remaining 35% of the Earth’s land area, and 47.2% of the Earth’s ocean area if we are to reach Wilson’s goal? This is one of the central questions behind this year’s Fall Symposium of the American Geographical Society, entitled Geography2050: Envisioning a Sustainable Planet. Thinkers and Doers from industry, government, academe and the social sector will provide their insights as to the geographies over which various conservation, restoration and other sustainability strategies will need to be deployed if we are to meet our collective societal goals by 2050. They are all encouraged to propose their own concrete geographies that relate to their specialty, whether it be forests, oceans, the Arctic, iconic species, sustainable cities, or what have you. But, this is a thought exercise that everyone can become a part of. For those of you on Twitter, check out the invitation to participate at https://twitter.com/geography2050. Who knows whether it is Donald Trump or Hillary Clinton who will become our next President of the United States. Rest assured, however, that the American Geographical Society will share the results of their “expedition to the future” with the future President, informed by the geographies that all of us believe need to be protected – far beyond the protected areas that are formally institutionalized today. So, Tweet your thoughts to @geography2050 today or email them to info@geography2050.org, and perhaps you can help shape a sustainable future for our planet.